The Pentek PD-50-934 filter cartridge is a thermally bonded polypropylene microfiber construction for higher filtration efficiency. The Pentek PD-50-934 water filter has a consistent flow rate and superior filtration performance. The Pentek PD-50-934 water filter cartridge will not impart taste, odor or color to the water being filtered. 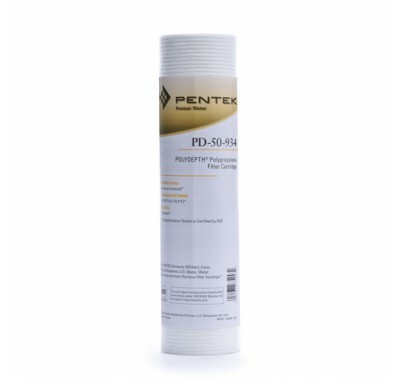 The Pentek Polydepth PD-50-934 water filtration cartridge is constructed of thermally bonded polypropylene microfibers to ensure high efficiency. The filter incorporates a rigid polypropylene center core for increased collapse strength and durability. The thermally bonded microfiber construction allows for minimal fiber release, consistent flow rate and superior filtration performance. It also is not brittle or prone to breakage problems like resin-bonded cartridges. The Pentek PD-50-934 polypropylene construction provides superior chemical resistance and is not prone to bacterial attack. NOTE: Do not use with water that is microbiologically unsafe or of unknown quality without adequate disinfection before or after the system. Nominal 50 micron Pentek PD-50-934 POLYDEPTH Polypropylene Water Filter Cartridge. 155752 Pentek PD-50-934 filter fits in housings for 10 inch water filters.